Do I need high index lenses? Especially if you’ve been reading up on different types of lenses for your eyewear, this is a relevant question to ask. Hig h index alternatives tend to be more expensive than their counterparts, so you don’t want to buy them just for the sake of it. Instead, you need to be strategic. Make no mistake: high index lenses are highly innovative. They represent, in many ways, the best technological advances in eyewear manufacturing. In a wide range of scenarios, they make perfect sense for your next pair of glasses. But that still means the situation has to be just right. Put simply, you don’t want to pay extra if a simple pair of glasses would do, or if you could get more relevant upgrades such as transitions or progressive lenses instead. So rather than answering the question this article started with through a simple ‘yes’ or ‘no’ answer. It makes sense to examine five common scenarios in which high index lenses make the most sense. Before we get started, let’s discuss the nature of this lens type to begin with. A high index lens is a lens that has a higher “index” of refraction. This means it has a greater ability to bend light rays to provide clear vision for people with stronger prescription glasses…. High index lenses are manufactured to be thinner at the edges of the lens and lighter in weight overall. With a relatively low prescription, the index doesn’t make much of a difference. But as your prescription increases while your eyesight gets worse, that same effect can result in increasingly thicker glasses with regular lens materials. High index lenses take care of the issue, because they are able to bend light rays at a higher degree so they don’t need as much thickness to compensate for your eyesight. With a thorough definition of the concept out of the way, it’s time to actually discuss the central question at the heart of this article: do you need high index lenses? We already noted that the answer depends on your situation. It doesn’t always pay to buy them just for their own sake. But if that situation falls into one of the below scenarios, the answer is a resounding yes. First things first: high index glasses are beneficial because they tend to be fashionable. Too often, especially for people with high prescription levels, glasses become cumbersome because the lens is so thick that it becomes difficult to find a frame or look that complements it. That is not the case with this alternative. High index lenses, in fact, are commonly used for fashion purposes because of how thin the lens themselves becomes. That thinness, as a result, can turn your eyewear from a cumbersome addition to your look to the central piece of it. You can still look fashionable, intellectual, and more regardless of your prescription. Let’s face it: today, glasses are as much as fashion statement as they are functional. How else could we explain the continuing trend of wearing frames without actual corrective lenses? With high index lenses, you can make sure that remains the case. So if you plan on using your glasses as a fashion accessory in addition to helping you see clearly, this lens type is the right choice. This scenario is already at least partially laid out above. At low prescription levels, high index lenses might not make sense. They are thin and lightweight, but so are regular lenses that only need to make minor adjustments to your eyesight. So if your vision is only slightly less than 20/20, especially as you are getting your first pair of glasses, you might not need to spend the money. That is no longer true, however, as your prescription gets more intense. Especially as you age, this is commonly the case. And when that happens, too often your glasses change alongside with it. They keep getting thicker and heavier, looking to compensate for increasingly failing eyesight. As that occurs, it makes sense to look into high index alternatives instead. Starting with your second and third pair of glasses, that becomes a more reasonable option. These lenses might even help you keep your preferred frame while substituting in a stronger prescription. You keep the same or even lose some weight and size, while still seeing clearly in the process. Crucially, high index lenses are not just thinner, but also lighter. They are made out of a lighter material, and less of it is necessary for production, so the light weight is a natural conclusion. That, in turn, comes with its own set of advantages depending on your situation. Heavy lenses automatically disqualifies them from some types of frames, because these frames cannot hold the weight well. That, in turn, limits your selection of frames for both fashion and functional purposes. Going with lightweight lenses instead significantly improves your choice of which frames to choose that suit your needs well. Heavy lenses, even if you find the right frame, also tend to slide down your nose, and even hurt your nose in some situations. Again, some frames can alleviate that issue, but being limited to those frames significantly limits your choice. With high index frame alternatives, you will not run into that problem. Have you ever heard someone referred to as bug-eyed? Sure, that can seem like an insult, but is often caused by their glasses. Regular lenses with strong prescriptions tend to act as magnifying glasses from both the inside and the outside; someone looking at you as you wear these lenses might actually see your eyes as either small or bulging, even though neither is the case in reality. Unfortunately, that is not just inconvenient, but can also introduce potentially significant problems. We tend to make first impressions from someone’s looks, and with this type of effect, these looks aren’t always favorable. Especially in professional situations, such as sales scenarios or client meetings, an inconvenience quickly turns into a significant professional obstacle. And again, the solution is simple: high index glasses reduce and minimize this effect. Regardless of how strong your prescription is, they allow you to look professional and well put-together regardless of the situation. So if you plan to wear your glasses in professional situations but need a strong prescription, this might be the perfect direction to go in. Finally, don’t underestimate the quality of a high index lens itself. Because the material is different from your regular glass or plastic lenses, it tends to be more scratch resistant. In a variety of situation, that scratch resistance can come in handy or even become crucial as you look to see clearly in adverse conditions. The situations in which this type of benefit comes into play range widely. Anyone enjoying the outdoors, for instance, will appreciate not having to worry about scratches from sand or little pebbles. You might not need safety glasses at work, but could still be exposed to the elements that could be responsible for scratching your lenses. Even yard work at home might require some of the benefits that scratch resistance can provide. As an added benefit, this type of scratch resistance can even save you some money. An anti-scratch coating on your lens tends to accomplish the same effect. It still works on high-index lenses, but in most cases, you’re already achieving a similar goal. You might not need the extra coating, making your high index glasses more affordable. High index lenses might not be the catch-all solution for all types of eyewear. But if you fall into any of the above categories, they sure come close. Advanced technology allows them to be thin, lightweight, and scratch resistant. In short, they give you everything you need to see clearly and comfortably in a wide range of situations. Of course, you still need to make sure that you find a lens and frame that actually suits your needs. That means not just making sure the material is right, but it’s actually built for your prescription. In other words, you need to find a reliable online merchant who can offer quality work, a wide range of selection possibilities, and a strong warranty and returns policy. That’s where we come in. Read our website to learn everything you need to know about high index lenses, from debunking common myths to switching your child to this opportunity. 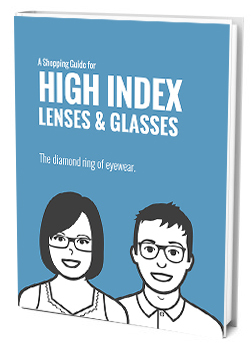 You can even download our shopping guide for high index lenses for more information. Then, find a merchant who offers them, such as Myeyewear2go.com, and look for a pair that suits your needs. That’s how you can maximize the potential benefit of this lens type, making sure that high index lenses are right for you.